Zeke Anon64bit 2 years ago. Here is the much awaited Nougat 7.0 ROM for Galaxy Express 2 CM14/CyanogenMod 14. For latest updates, stay tuned to the Lineage OS device list page. This Nougat 7.0 has come for Galaxy Express 2 via CyanogenMod 14 ROM. Since Google released Android Nougat Source code, we have update many Android NOUGAT AOSP ROMs and also many CyanogenMod 14/CM14 ROMs updated and many are yet to come. This CM14/CyanogenMod 14 for Galaxy Express 2 is brought to you by developer kotzir. Earlier kotzir had brought Galaxy ACE 3 LTE CM13 Marshmallow ROM, Galaxy ACE 3 LTE CM14 Nougat ROM and Galaxy Express CM14 Nougat ROM. If you like his work and want him to keep up his work, then you can Donate him via PayPal using this link. Download and Copy the GApps and Galaxy Express 2 CM14/CyanogenMod 14 ROM ZIP to your phone. Reboot and Enjoy the CM14 for Galaxy Express 2. 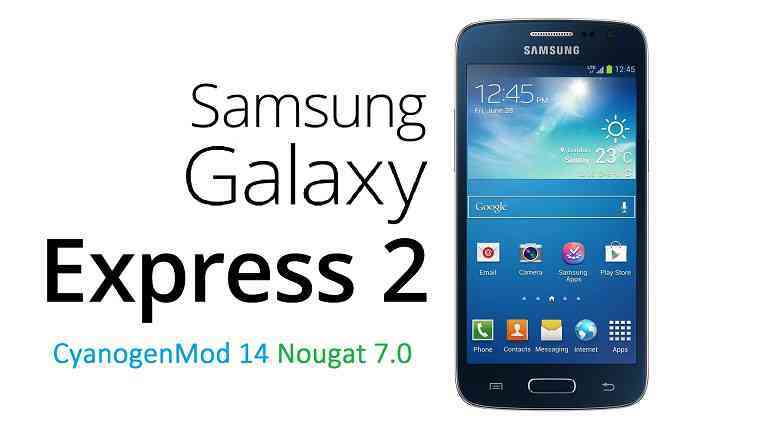 Copy the latest Galaxy Express 2 CM14/CyanogenMod 14 ROM ZIP file to your phone. Stay tuned or Subscribe to the Galaxy Express 2 forum For other Android Nougat ROMs, CyanogenMod 14 ROMs, other ROMs and all other device specific topics. You Can find the Development page of Galaxy Express 2 CM14/CyanogenMod 14 Nougat 7.0 ROM, here. Can you tell me what error are you facing? Please come up with enough details and also your device details too on which you were flashing this ROM. I was using TWRP to install the rom and Gapps and i’ve got “Error: unable to open zip file”. I had this error when i used the sd card. Installing from internal memory works perfectly. Sorry for my comment, i was upset at the moment :). How do i change themes? CM13 version had an app for that, thanks. Hi, can you get a version of Lineage Nouget on the express 3 up and running, or is it possible this version already works for the 3?